Sister Gaia Love has been a Sister since 2011 and is currently the Treasurer and Board of Directors Vice-Chair of The Sisters of Perpetual Indulgence, Inc. Their passion is in non-profit administration and advocacy focusing on LGBTQ issues and urban planning. 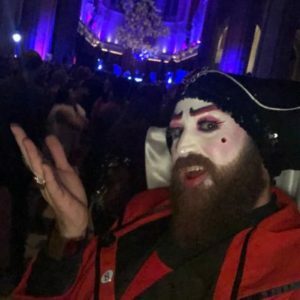 Sister Gaia has been involved and served in leadership positions with national award winning non-profit organizations to include Bike San Diego, the Balboa Park Heritage Association, The San Diego Sisters of Perpetual Indulgence, The Los Angeles Sisters of Perpetual Indulgence, and the Special Olympics. Steve Clark Hall is a native of San Francisco and has been owner of his 1885 home on 19th Street since 1984. He is a California state licensed general contractor who specializes in historic preservation. He has extensive experience in non-profit public benefit corporation management and served as the first President of the Eureka Valley Foundation when formed in 2008. He also serves as the Treasurer of the Eureka Valley Neighborhood Association. Shaun Haines is a San Francisco native an LGBT community leader, an Associate Member San Francisco Democratic Party, Delegate California Democratic Party, Founder and President San Francisco Black Community Matters, Founder and Executive Director of San Francisco Impact Partners. Shaun has a keen and critical eye on public policy, community affairs, social justice and Democratic Party politics. His goals are to affect the remediation of disparities that impact communities that are most in need. Ben Hutchinson has lived in San Francisco since 2011, and the Castro neighborhood since 2015. He is passionate about the role of public space, greenery and good urban design in supporting safe, vibrant and sustainable urban living for everyone. His day job at Google involves analyzing urban traffic and transportation data, and promoting transparency and accountability in data analysis. Gary is a former Policy & Community Affairs Manager for the SF Recreation & Park Dept. Gary was appointed by Governor Brown to serve on the newly formed California Homeless Coordinating and Financing Council, he also serves as Vice Chair & Policy Chair to the SF Shelter Monitoring Committee as a Mayoral appointee, as well as the CFO for a substance-abuse recovery-based non-profit. Gary is also a former board member of the Castro Country Club Advisory Board – a safe and sober coffee house and meeting space dedicated to the recovery of LGBT addicts and alcoholics. Previously, Gary served as a Legislative Assistant to 3 members of the SF Board of Supervisors with focuses on policy and legislation and neighborhood quality of life initiatives. Prior to working for the City, Gary actively advocated policies that serve the homelessness and unhoused populations. Gary, himself, was homeless and living on the streets of SF and in the Castro for over a decade. Kathy is the owner and operator of Cruisin’ the Castro Walking Tours since 2005. The tours offer the most comprehensive LGBTQ tour in San Francisco. A Castro resident of 18 years, (12 years on 17th Street across from the PTP), a local historian and civil rights activist. Founding and current Board Member since 2007, for the Rainbow Honor Walk, (bronze sidewalk plaques in the Castro, honoring famous sexually diverse people whom have made a difference in the world . Also serves on the SF Planning Committee’s “LGBTQ Cultural Heritage Strategy”, which was created to identify and preserve historical LGBTQ sites in San Francisco.